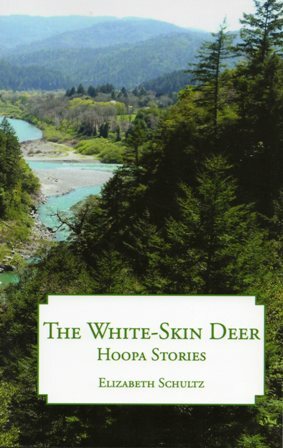 WHITE-SKIN DEER: HOOPA STORIES, $12, ISBN 978-0-9800102-2-0. 64 pp. Six illustrations of vintage 1950s photographs of Hoopa Valley, including tribal members. Published with support of the Haskell Indian Nations University Cultural Center & Museum and the Imagination & Place Committe, Introductin by Thomas Pecore Weso and Denise Low. The White-Skin Deer: Hoopa Stories is a first-hand, fictionalized account of tribal elders’ stories, written by a sincere and respectful non-Native woman, Elizabeth Schultz. Schultz wrote these stories based on her experiences living on the Hoopa Valley Tribe’s land during the 1950s. This was a time period when Bureau of Indian Affairs policies of assimilation were at their height. Their boarding elementary and high schools actively worked against Native cultural practices, including Native language, ceremonies, economic systems, and kinship responsibilities. Like all good fiction, these stories prompt reflection. Embedded within them are the conflicts facing most American tribal peoples at that time as well as the present.